The Rio 2016 Women’s Olympic Football Tournament kicks off 3 August, two days before the opening ceremonies, with six group stage matches featured in three host cities. Canada’s Women’s National Team will face Australia on the tournament opening day at 15:00 local (14:00 ET / 11:00 PT) at the Arena Corinthians in São Paulo, Brazil. 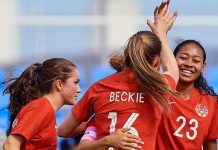 Getting points in Canada’s first match against Australia, the reigning Asian champions, is important to ensure Canada is in a good position to earn a spot in the Quarterfinals. Canada will face first-time Olympic participants Zimbabwe on 6 August in São Paulo, before heading to Brasilia to face powerhouse, European Champions Germany 9 August in the final group stage match. The top two teams in each of the three first-round groups plus the two best third-place finishers advance to the quarter-finals of the Olympic competition. Canadian fans can expect a physical, close match when Canada faces Australia Wednesday. The two teams have not faced each other in an International A match since 2008, but there is familiarity for Herdman since he coached neighboring New Zealand before coming to Canada in 2011. The two sides also faced each other in a training scrimmage in Cyprus in advance of last year’s FIFA Women’s World Cup Canada 2015™. 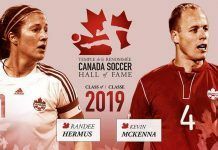 Since finishing sixth at the FIFA Women’s World Cup Canada 2015™ last year, Canada Soccer has added some new faces to the Women’s National Team roster, increasing the pace of the offensive line and adding some youthful energy to a lineup anchored by veterans. The revamped Canadian side has been together since early June, when Canada hosted Brazil in a Road to Rio series in Ottawa and Toronto. The team has gelled during this time, and impressed on the pitch. Captain Christine Sinclair is Canada’s most capped international player (245), Canada’s all-time leading goal scorer and second in the world for career international goals after surpassing American Mia Hamm while at the CONCACAF Women’s Olympic Qualification Championship in Texas. With 162 international goals, she is only 22 goals behind all-time leader Abby Wambach (USA/retired) with 184. All four of the active top ten Canadian women’s goal scorers will be present in Rio, including Sinclair (162), Melissa Tancredi (25), Diana Matheson (17) and Sophie Schmidt (16). Deanne Rose is the youngest player on the team at 17 years old. Rose recently scored her first Canadian Women’s National Team goal at the CONCACAF Women’s Olympic Qualification Championship. Women’s National Team (WNT) appearances: Sinclair (245), Matheson (185), Wilkinson (177), Tancredi (119), Schmidt (151), Scott (112), Buchanan (58), Bélanger (52), Lawrence (40), Chapman (34), Labbé (32), Fleming (30), Quinn (21), Beckie (20), Prince (18), Zadorsky (17), Rose (14), D’Angelo (2). WNT goals: Sinclair (162), Tancredi (25), Matheson (17), Schmidt (16), Beckie (9), Wilkinson (7), Bélanger (7), Prince (6), Lawrence (4), Buchanan (3), Quinn (3), Rose (3), Fleming (3), Chapman (1), Zadorsky (1), Scott (0). Collectively, this squad has scored 266 goals for Canada’s Women’s National Team. Goalkeeper clean sheets: Labbé (15), D’Angelo (1).